“What volunteering do you do?” Eddie Mair asked of Francis Maude, Minister for the Cabinet Office, when he was championing David Cameron’s ‘Big Society’ on Radio 4. “I do… golly what do I do? I do erm… a whole load of things…” was his response. I love hearing a Tory squirm. The thing is, I think people should give more of their time to their community, if they’ve got the luxury of spare time that is. Being part of a wider community is one of the essential emotional needs of human beings. It helps you focus on others instead of obsessing about yourself, gives you a sense of achievement and gets you relating to other people, all of which make you a happier, more fulfilled, less insular person. But what volunteering do I do? None, that’s what. I decide to redress the balance one cold, Sunday morning by volunteering with Friends of Hollingbury & Burstead Wood, a group who get together once a month to tidy, clip, prune and dig their local woods. Hollingbury and Burstead Wood is a narrow strip of woodland just off Ditchling Road in Brighton. It’s a haven for wildlife and humans alike. I often walk my dog around the well-kept woodland paths. It’s so peaceful, especially considering it’s so close to the city. I’ve listened to jays screeching around the allotments there, seen a slow worm crossing the path to get back to its compost bin hiding place; I’ve even spotted a kestrel hanging in the valley as if held by wires. It really is a special place and the volunteers I meet all share my love for it. A mixed age-group of volunteers turn up. Some of the older members have brought along their grandchildren. Local park ranger Dominic Franklin is on hand to tell us what to do and to gently encourage us. I get stuck in, carrying felled branches to a pile in the woods as others chop them down to introduce light into a small glade. Just to be doing something physical after a week of sitting at my desk is just so enjoyable. As the morning progresses, the sun comes out and warms our backs. My pile of branches is soon so high I have to climb on top to squash it down; the perfect excuse to climb trees as a 37 year-old. The young members of our group enthusiastically hack off branches. They don’t need to be thanked, they’re just enjoying it. 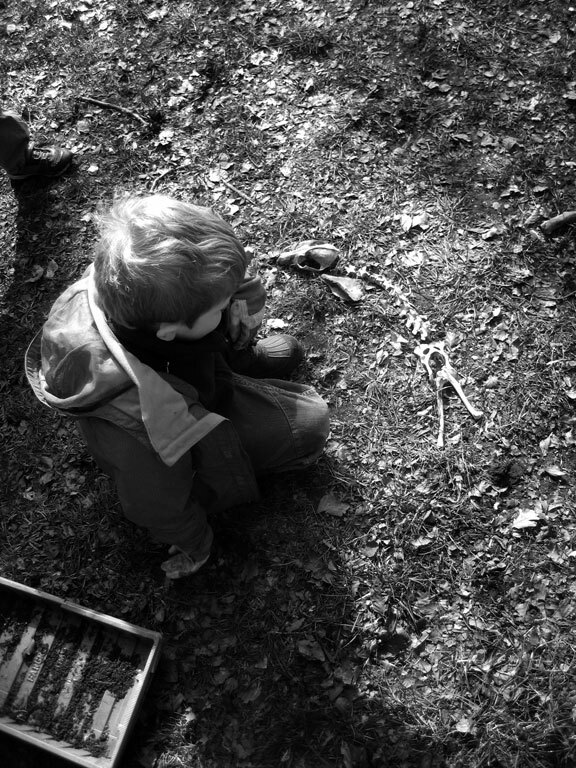 One of them finds a fox skull, and then a spine, until they unearth most of a skeleton, proudly laying it on the ground for everyone to see. I try to take it easy. The last time I did any conservation volunteering I was pulling up ragwort. The next day I woke up with such severe back pain that I was off work for days after. Even though there are 60-year olds doing more than me in this group, I’m not taking any chances this time. We stop for tea and everyone chats. I’m struck by the group’s dedication; some of them have been helping out in the woods for many years. The group itself started after the woodland destruction caused by the Great Storm in 1987. Remarkably, the membership fee, a measly £2, hasn’t gone up since then. I get a warm welcome from everyone and, even though they obviously have all become good friends, I’m never made to feel like an outsider. 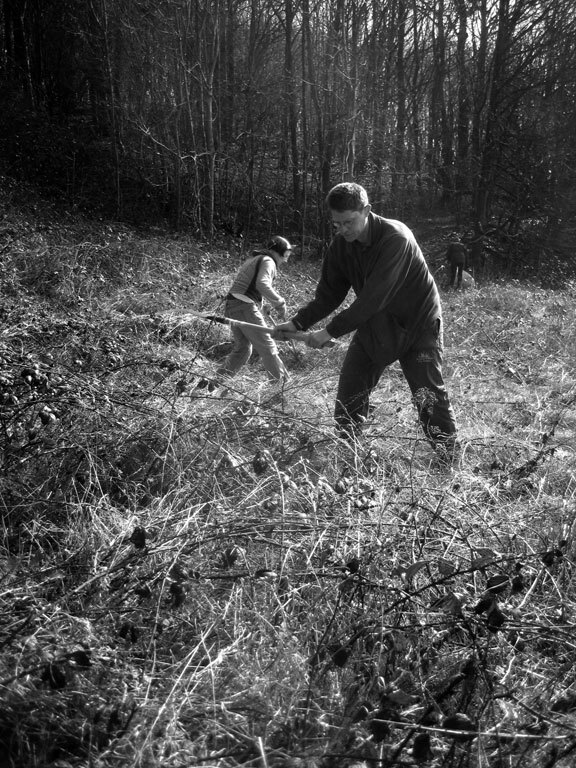 We make our way to the next site where we begin work on clearing a path through some brush. On the way there, people pick up litter into black bin bags; they aren’t told to do this, it’s just part of their day, part of their responsibility as a volunteer. I’m very impressed. They really don’t like dog poo though. Frequently the cry goes up, ‘Just look at all this dog poo!’. After slashing a few brambles we call it a day. I get a firm handshake from the ranger and a warm, no-obligation invite to come again, which I certainly will. Stick that in your pipe, Francis Maude!